One of the most common questions among prospective buyers of radiant heat systems is: “How much will it cost to run the system?” While there are many factors that contribute to the answer of this question, we still can offer a formula that will help you determine what you can expect in terms of operating costs. Keep in mind that the operating cost of a snow melting system will depend on the specifics of the system. Warmzone custom designs each snow melting system to ensure peak performance and energy efficiency. Radiant snow melting systems are designed specifically for the winter conditions in your area. Everything from altitude and average snowfall is considered as well as average winter temperatures. 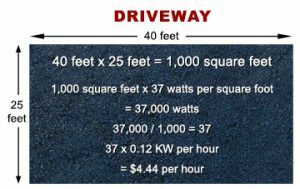 Before using the formula shown here to calculate the operating cost of your snow melting system, you’ll first need to know the kilowatt per hour rates of your local power utility company. These rates vary from region to region, so we used the average kilowatt per hour rate for the formula attached. Warmzone’s experienced design team configures your snow melting system to best meet your snowmelt needs in the most efficient manner possible. The ClearZone snow melting heat cable is a proven industry leader that is available on spools or pre-spaced in mats for simple “roll-out” installation. While systems vary, residential snow melting systems typically operate at 37 watts per square foot while commercial snow melting systems operate at 50 watts per square foot. The formula shown here would therefore change accordingly and you would multiply the square footage by 50. ❶ Determine the total square footage of the area that will be affected. ❷ Multiply the square footage by the heat required (e.g., 37 watts per square foot for residential). This will give you a total for the watts per square footage required. ❸ Divide this number by 1,000 to convert to kilowatts. ❹ Look up the kilowatts-per-hour rate from the local power utility company. ❺ Multiply the total watts-per-square-foot by the watts-per-hour. ❻ This gives you the cost per hour of usage for the snow melting system. To find out more about Warmzone’s industry-leading snow melting systems, call888.488.9276 and speak to a Warmzone professional today. If a picture is worth a thousand words – as the saying goes – how much is a video worth? “Invaluable”, said Troy Lindsay, general contractor and owner of PAE construction in Denver, Colorado. While installing a radiant heat system is a not an extremely difficult task, it is still crucial to follow the correct procedures to ensure the system performs as intended. Considering the importance of proper installation, Warmzone extends the industry’s most extensive customer services. These customer offerings include personal installation support, detailed system design / layout services, and free installation training courses. These valuable services give professional builders distinct advantages when it comes to purchasing and installing radiant heat. The addition of an extensive online resource of instructional videos will further benefit contractors and simplify the installation process. A veteran installer of commercial and residential radiant heat projects, Lindsay understands the value of instructional videos. “Having access to training videos will be an asset to installers everywhere,” he added. “It’s great being able to talk with electricians and designers at Warmzone during the installation process, but sometimes it really helps to be able to SEE what is being explained. Videos help to make things clear and can help keep Warmzone and installers on the same page and on track during the installation. Ultimately, the videos can save us time and money in the long run, and every contractor likes the sound of that!” he concluded. Warmzone senior training and support specialist, Jim Sage, reiterates the value of the soon-to-be-released video library. Watch for Warmzone’s new online video library launch, and take advantage of the information provided by Warmzone. In addition to our superior customer services, Warmzone radiant heat systems are at the top of their class and can be customized to accommodate virtually any type of radiant heat application. For more information on installing an interior or exterior radiant heating system before next winter, call a Warmzone pro at 888.488.9276.